Thinking about picking up Poker Night at the Inventory, Telltale’s newest offering because of a deep seeded love for Tycho from Penny Arcade? Maybe you have a thing for the accent of Team Fortress 2‘s Heavy? Perhaps there’s a penchant for that loveable lucha libre Strong Bad? Or it could be that you have a soft spot for Max, the rabbity-thing from the Sam & Max series. Whatever your secret reason for considering the purchase, you best get a move on because the game releases this Monday, November 22 and after then, the pre-order special item and pricing are gone for good. All those who order Poker Night at the Inventory before November 22 will not only get a 10% discount, bringing the price down from $4.95 to $4.49, but you will also get an exclusive poker visor to dress up the Heavy in Team Fortress 2. The visor isn’t the only piece of swag that can be earned from playing poker with animated characters though. If a character gets low on funds, they might just ante up some clothing to make their bet. Win the hand and the extra TF2 unlocks are yours; check out the details below.Max will cough up his Lugermorph handgun, usable by the Scout and Engineer in TF2. He will also ante up his Freelance Police badge that can be used by any character in TF2. Tycho will toss in his wristwatch, wearable by the Spy in TF2, while Strong Bad will surrender his Dangeresque sunglasses, which only the Demoman is cool enough to sport. Lastly, the Heavy gets even by offering his Iron Curtain weapon, conveniently only usable by – you guessed it – the Heavy in TF2. 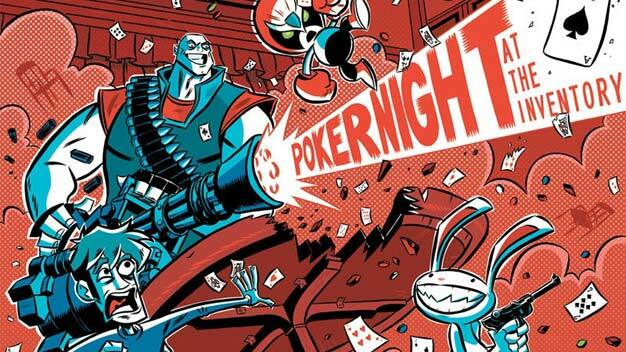 This is a great deal for those who are really into Team Fortress 2 and for those who like poker. I just hope it has a wider appeal to people outside that demographic.